there is nothing better than letting the Saturday morning farmers market inspire you. beautiful bunches of rainbow swiss chard, curlicue scape's, freshly baked breads, gooseberries, blueberries, currants and baby lettuces all at the ready for you to scoop them up and take them away. the past two Saturday markets, i have come across the most beautiful organically grown rainbow swiss chard. i swear it calls to me, i cannot not buy it- that would be a shame. 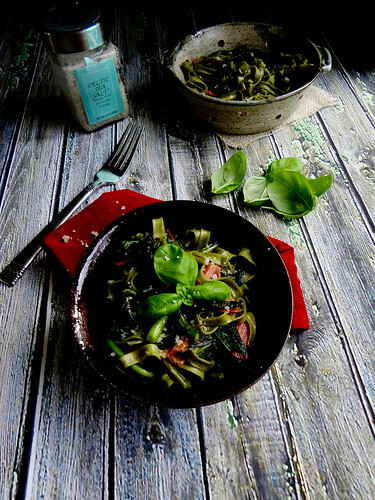 scape's & literally the best garlic ever from picnic rock are lightly sauteed with olive oil and chard. not sure what a scape is? they're not as scary as they seem and not just for pesto either. the scape is basically a flowerless plant stalk, in this case the garlic scape is removed from the garlic plant to focus all its growth to the bulb - pretty cool huh! i love sauteing them in stir Fry's or with pasta and adding them to soups. 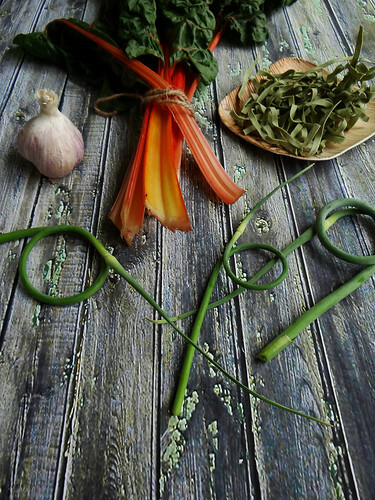 so next time, don't just eyeball the garlic scape's during your trip to the market, pick some up and get creative! 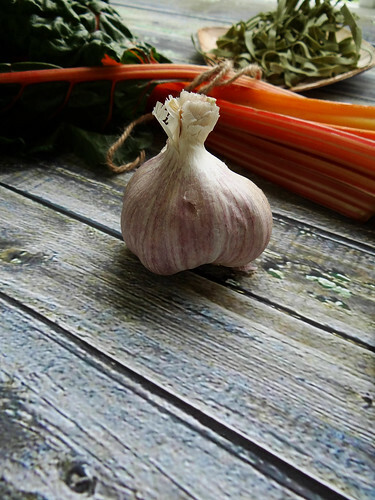 naturally, garlic scape's have many of the same health benefits as garlic - so eat up! 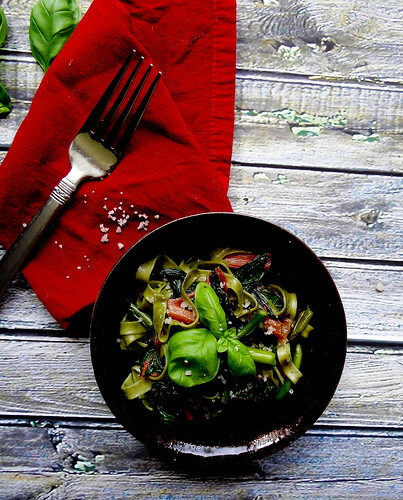 are you wondering about the green pasta yet? let me tell you.I have been eyeing that green pasta for months now at my local health food store, sunflower. for one reason or another i pass it up (laziness?do i really need another pasta in my pantry? )so i did the next best thing; bought it for my vegan foodie pen pal Melissa, over at the vegan fling (who is absolutely amazing and you should go and check out her blog today! like right now! ).then this past weekend i caved, a bag wandered its way into my shopping basket.let me tell you. it was the BEST fettuccine i have ever had. 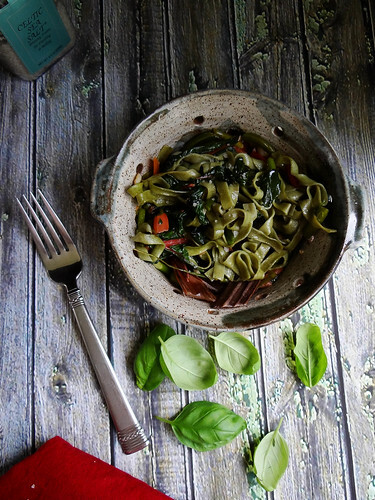 Bona Chia Spinach Fettuccine is vegan cooks in just 3 minutes - super fast & super good. I really loved the way the noodles held their shape and cooked perfectly - firm yet tender. did i mention they are made with chia flour too! 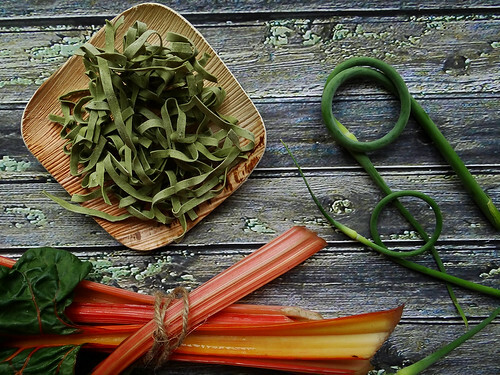 the chard & scape's are tossed with fettuccine & a tad bit of cooking water. a good flaky sea salt is sprinkled over the finished dish. fresh basil from the garden is added in at the very end - i love the way fresh basil adds such a earthy "greenness" to the overall dish. come august, i have a feeling basil will be added to everything in my kitchen, the basil plants are exploding along with the oregano. do you have a favorite early summer pasta dish? Justin and i made a variation of this the other night using a wider variety of veggies with a splash of balsamic and fresh lemon juice - equally amazing. however, i really love the simpleness of this meal as it is. 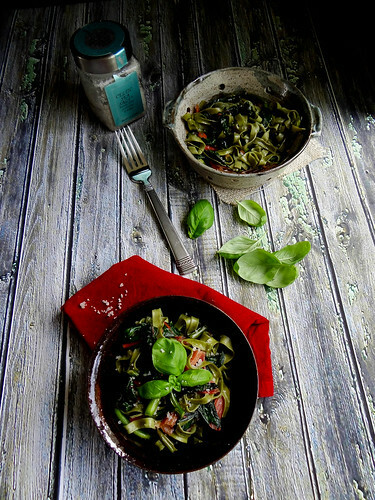 in a large saute pan, drizzle a small amount of olive oil into a pan. over medium high heat saute the swiss chard, garlic and scape's, sprinkle with a bit of salt. while sauteing veggies, bring a medium pot of water to a boil. cook 2 servings of pasta for 3 minutes - remove from heat, drain & reserve 1/4 cup or less of cooking water - set aside. once the veggies are cooked to your liking transfer the pasta to the saute pan, toss the pasta and veggies together adding a bit of the reserved cooking water if needed. 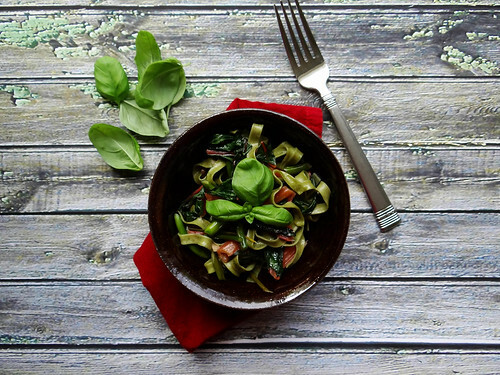 transfer pasta to 2 plates or bowls, top with basil and sprinkle with a healthy pinch of flaky salt. Tomato and Chickpea sauce sounds amazing - you are so right anything would be utterly amazing with these noodles! SO gorgeous!! I love being inspired by the farmers market. 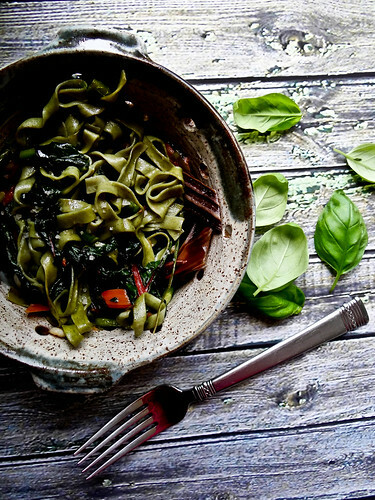 I've never heard of pasta made with chia flour but I'm fascinated - I'll be on the hunt for that right away! Thanks Jeanine - I couldn't pass up the pasta for like a 3rd time, it sounded way to interesting, and it was so good! It looks absolutely delicious! Fantastic photos. 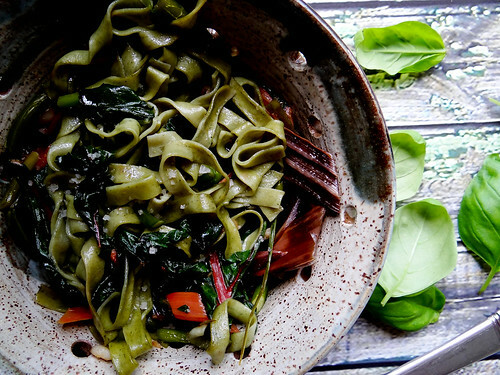 I'm not even a pasta person, but those green chia noodles look so lovely! I think I might be caving and adding them to my shopping basket soon! Also- gorgeous photos, Heather! I know I say that a lot, but these are just stunning. I had to carry my laptop over and show Chris. He also is a big fan of your photos. :-) Have a great weekend! I know right, we eat pasta on a occasion- typically quinoa pasta, but these were so so GOOD- seriously the best pasta ever and super quick to make which I love! There is so much inspiration to be had at the Farmers Market- I love it! Green chia noodles? What a great find! I love being inspired by fresh local produce. When you shop at a grocery store it's so easy to get into food ruts. It so much more fun (and earth-friendly) to let the adventure of a market take you over. What a gorgeous plate of food! Your photos are just perfect, too. I have yet to use garlic scapes, but have been thinking they might be perfect for a slightly greener garlic flavor. Sadly, I haven't been cooking at all... even boiling water is too much in this heat. It has to cool down one of these days, right? Right? Thanks Willow xo - I am hoping for you that the weather cools down - I did my Northerly Wind Dance for you - has it worked yet? Thanks Uru - the Chard has been so plentiful and beautiful this year! i don't eat pasta, but i would eat this dish in a heartbeat. it looks absolutely delicious. 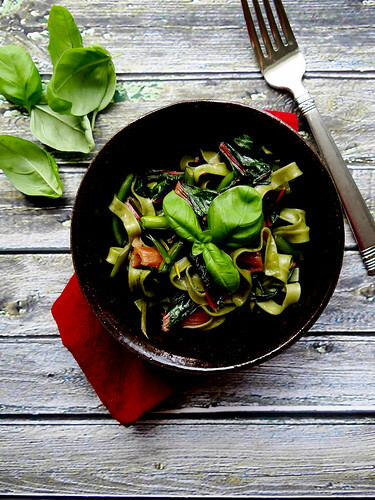 i love the green color of the pasta mixed with the swiss chard leaves. beautiful! what a gorgeous gorgeous dish! oh my gosh! and those photos are just stunning! rustic, yet gourmet:) and i agree! i love going to farmer's markets and letting the fabulous produce inspire me! Have a great weekend! That is absolutely gorgeous! I'm kicking myself that I don't have any of the ingredients in my house to make it! Sounds like a trip to the Farmers Market is order for you Somer! Gorgeous indeed! 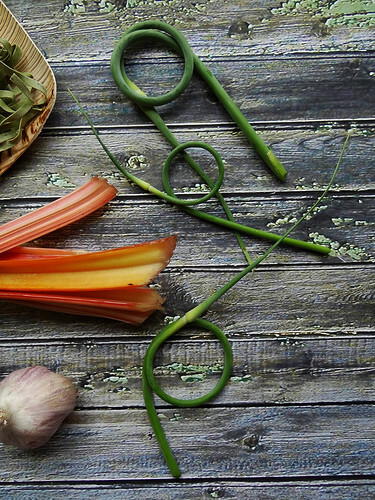 Beautiful photos - does the lovely farmer's market finds justice. So rustic. I want to eat this dish right now! YUM! Thanks Court! I really wish I could make this dish for you, in person with a glass of champagne :)...and maybe a few of your strawberry blondies! i love the deep colors! Aww thanks Richa! We don't do laods of pasta but this was so amazing! 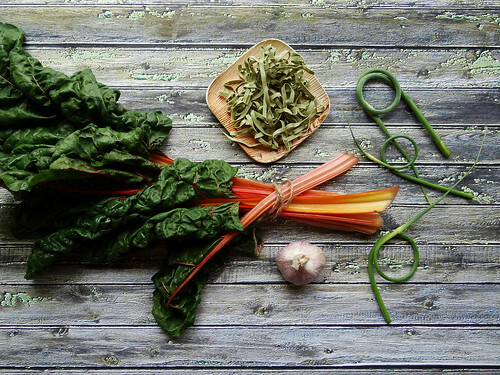 Rainbow chard is a beauty isn't she - I am jealous if I could I would totally laze around the beaches! 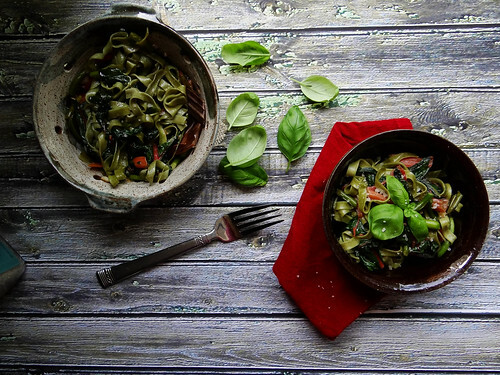 Love the green color!This recipe looks insightful. I am gonna add broccoli to this and taste it. . .! Frankly, I don't like pasta. However this recipe seems something good. I will try and comment here again about my experience. Thank you for some other informative blog. Where else could I get that type of information written in such an ideal means? I have a mission that I’m just now working on, and I have been at the look out for such information www.driversin.com.